Feeding Tampa Bay is launching a community-driven effort to end hunger and food insecurity in Tampa Bay by 2025. In doing so, the nonprofit will reshape its mission to take on new challenges. For 35 years, Feeding Tampa Bay has been the major food distributor to more than 550 charities and agencies operating food programs and disaster relief in the 10-county region which includes Hillsborough, Pinellas, Polk, and Pasco counties. Among its new goals will be establishing new innovative methods and locations to distribute food; providing more healthy, nutritious food; building new partnerships with social services providers; and, a job training program. Feeding Tampa Bay announces new strategy for ending hunger.Feeding Tampa Bay also plans to build a new headquarters in the next few years. The agency currently operates from an 80,000-square-foot warehouse on Adamo Drive in Tampa. 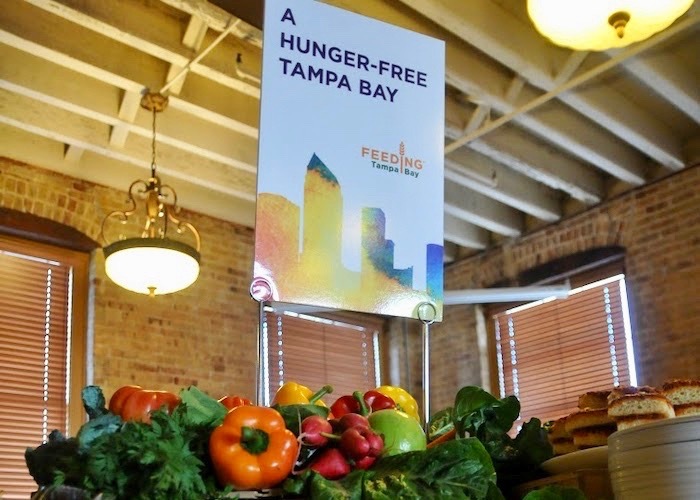 Mantz revealed the new direction for Feeding Tampa Bay on March 13 at a presentation at the Lions Eye Institute in Ybor City. The traditional model of a food bank typically operated by a church or faith-based organization is a “starter model” for ending hunger, says Mantz. We need to find ways to deliver food in new and innovative ways, he says. One plan is to open five to six new Trinity Cafes in the region to serve more hot meals, and even take-away meals. Mantz says sites are being considered, including in Hillsborough. Trinity Café currently serves meals at its location on Nebraska Avenue in Tampa. Tables are set with cloth, plates, and silverware. Volunteers serve three-course meals. “The Trinity Café will become community empowerment centers to bring folks together,” Mantz says. A job training program will offer 13 weeks of instruction for people in truck driving, warehouse, customer service, and culinary industries. More than 100 people a year would complete the training. Feeding Tampa Bay also plans to expand its outreach to people who are above the poverty level but don’t have funds to match their expenses. “Food is often the thing that gets compromised because you have to have a place to live,” says Matt Knott, president of Feeding America. Despite a good economy, there are many working families who struggle to put food on the table, says Suzanne McCormick, chief executive officer of United Way Suncoast. “If you only look at people who live in poverty, it’s a completely inaccurate picture of people in need,” she says. The average national “living wage” for a family of four is about $55,000, and somewhat higher in Tampa Bay, McCormick says. Other goals are to increase the number of food pantries at schools and to make sure that 80 percent of food that is distributed is healthy and nutritious. By 2025, Feeding Tampa Bay anticipates serving 115 million meals a year. The future also could include opening grocery stores.